The winner of the $590 Nordstrom gift card is Katie H! That jumper is so cute! Love how you paired them with the skirt. love the idea of a sweatshirt with a flippy skirt, I haven't done that in a while. You are rocking it girl! I love the textured tights! Cute sweatshirt! Those tights are super cute too. i never thought i'd live to see grunge back in style, but here come the 90s! i always wanted doc martens but my mom wouldn't let me have them! I really wish I had saved my Doc Martins too! So cute! Come by Friday and link up for FUN FASHION FRIDAY! It's a new link up party and I'd love to have you join in! The Docs are everything! You are killing it in this look girl! Loving this tee/sweatshirt. And I especially love that you paired it with a skirt/tights. Great combo!! I love this look with those tights! This is the perfect way to wear the trend! I love the girly silhouette of the skirt and those wedge booties! This is so very chic! Love this look, Jill - so Fun! I absolutely adore your tights! stunning!! Adore your blog too! Outfit on point! Loving that sweatshirt. Adorable!! 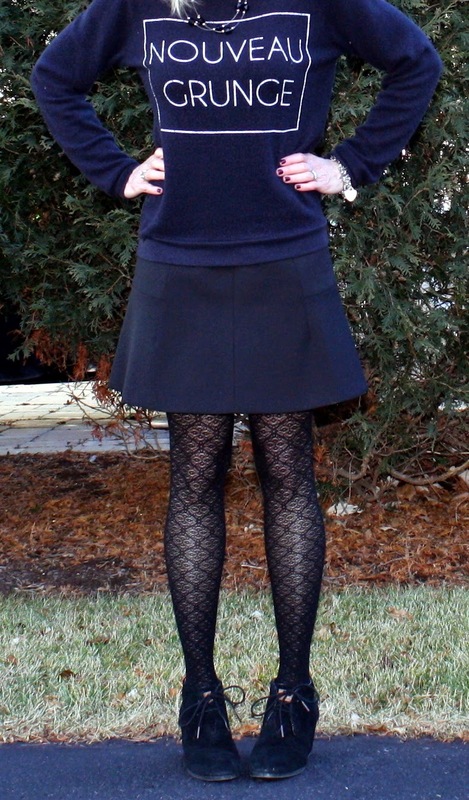 Loving the edgier look on you and those tights are too cute! This all black outfit really works and I love how it has a little edge to it. The patterned tights go great with those wedges! Haha I have definitely thought that about Doc Martins before - I can't believe they are cool again! I love this look on you - so glam with an edge! I love this outfit on you! Your tights are perfect and I love the necklace! Love the patterned tights! I haven't been brave enough to try a pair yet, but yours look really great with this outfit! What a great look on you! Those tights are so awesome! You are too cute! You are cuter by the minute...is that possible? Sometimes I like a little grunge. Well, at little girly grunge anyway. Cute graphic sweatshirt! Love this dress yet casual look. Great skirt, sweatshirt and tights. To me it doesn't look grunge lol. I adore this look! The sweatshirt is hot! Fun look. Those tights are awesome. I want that sweatshirt so bad. Love it. Love that sweater and how you styled it! Fun sweater, I missed the 90s and my Doc Martins. Doc Martins!! I rocked those out!!! Fun & I totally love those booties!!! Aww such a cute look! I love the tights! That top is so fun! And I am loving your patterned tights! Today's grunge is the kind I can handle. Polished grunge perhaps? I think you've executed it perfectly. Thanks Melissa! So glad you stopped by! Thanks Andrea! So glad you stopped by! Thanks Joanne! I'm so glad you stopped by! Hope you are having a great week so far! Thanks Karen! There are so many cute tights out there right now! Thank you so much! It's a super cozy sweatshirt! Thank you so much Vanessa! I appreciate that! Thanks Claire! I appreciate you stopping by! What a great trendy look - you pulled it off fabulously! Stopping by from #realmomstyle at MommainFlipFlops! This look is fantastic on you! I never got into the grunge look of the 90s although I was known to sport a flannel shirt like no one's business! wow! you look amazing! loving that snazzy outfit! I love navy blue! Those tights are so fun! Thanks for joining the Celebrate Southern Linkup last week! Love your sweatshirt Jill, this is such a cool look on you!! Love your take on the 90's grunge comeback, a little edgy and chic. Have a great day. I love this edgy look! That sweatshirt is really cool and i Love those tights! This is such a great look for not so basic black! Love this! A mix of edgy and glam is a perfect way to describe it. You should totally wear this vibe more often. It looks great on you. Your graphic sweater is such fun! Edgy and glam describes is perfectly!